Released practically in tandem with Sacco's Journalism, reviewed way back in our June listings, we somehow failed to get around to mentioning it here until now, for which we apologize. 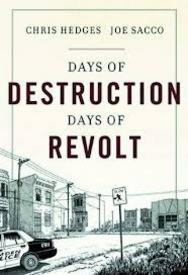 Days of Destruction Days of Revolt takes a novel hybrid approach to long form reporting, combining Hedges's five lengthy essays describing the lives and living conditions in Pine Ridge, South Dakota, Camden, New Jersey, Welch, Wes Virginia, Immokalee, Florida and Liberty Square, New York City with Sacco's vividly detailed illustration – most are large, full page and double page splash in size – and straight-up comics pieces, which are six to fourteen pages in length and are the real deal. Hedges and Sacco "set out to take a look at the sacrifice zone, those areas that have been offered up for exploitation in the name of profit, progress, and technological advancement. 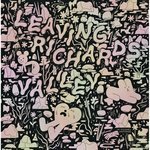 They wanted to show in words and drawings what life looks like in places where human beings and the natural world are used and then discarded to maximize earnings."